Finally got the time to take some more up-to-date photos. You'll have to forgive the quality, since most of these were taken with my iPad 4. 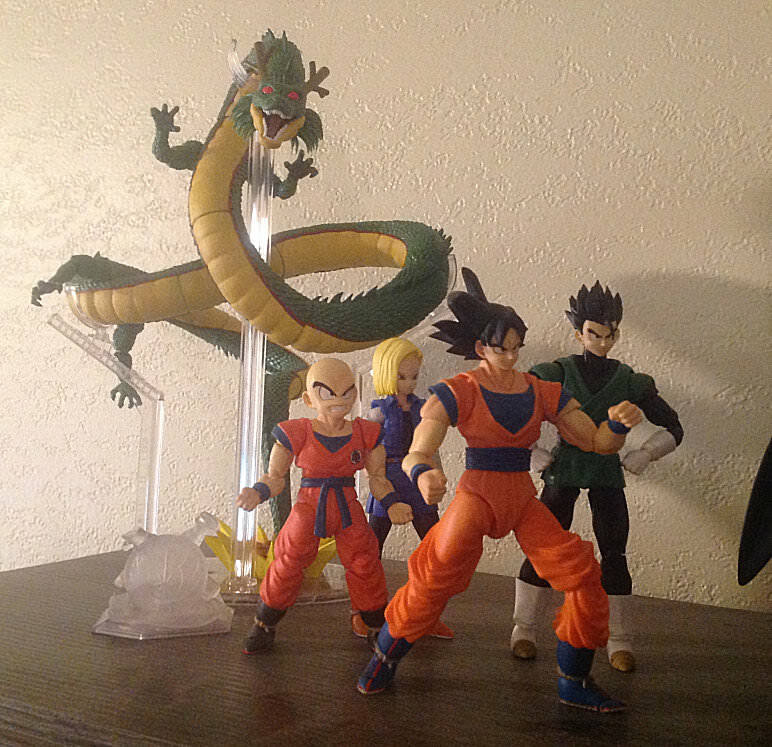 First of all, my Figuarts collection. 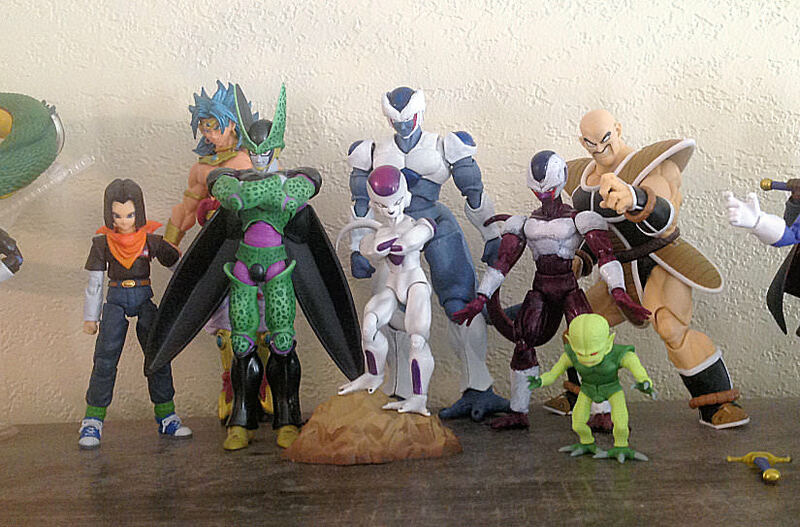 It's fairly modest, but as I mentioned in my introduction thread, I'm fairly particular about what I buy, and I came into the line late enough that must-haves like Cell were in the 150+ range secondhand. I recently pre-ordered the upcoming PCE Cell, XV Trunks, and XV Hero, and I plan on using the latter two for some custom additions. I should also add that I actually keep these on a shelf in a cupboard, but I moved them into the dining room for better lighting. 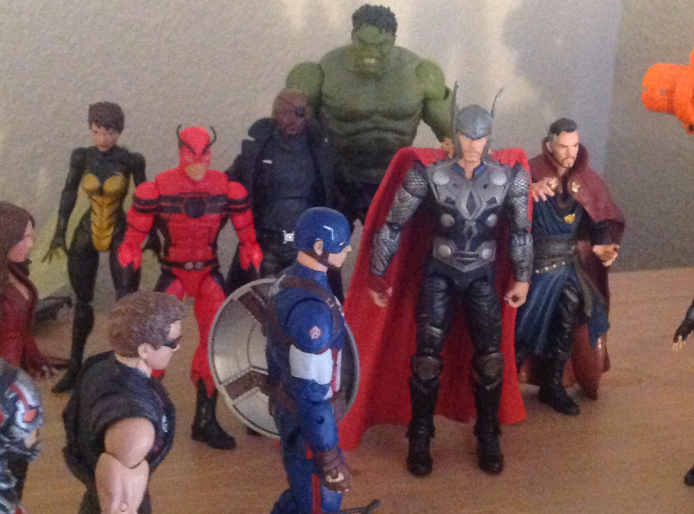 Next up, my MCU shelf. I've thrown in Wasp and Giant Man, mostly because they're staples of the Avengers for me and Hank's unlikely to suit up himself. I'm sure someone will note the lack of Spider-Man, but I am not paying $60 for the 3 pack just to get a figure that I'm sure will come out again (or even a better version) alongside Sony's film anyway. As for WS... eh. I'm sure I'll get there, but I honestly didn't like either figure. Finally (for now) my Spider-Man figures. I have a few of these guys, including some WIP customs. This is a WIP for my list. Didn't realize how late it was getting tho, so I'll edit with details after I get settled in at work. Edit: Ok, settled in now. The big thing I should notate is, this list is just a wip, and the order of characters is pretty much just whenever I chose to add them (they're only numbered to help me keep track of how many are in each category). Pretty much everyone in the Possible category can be ignored or replaced at any time, and are really just dependent on what figures get released (Ex. 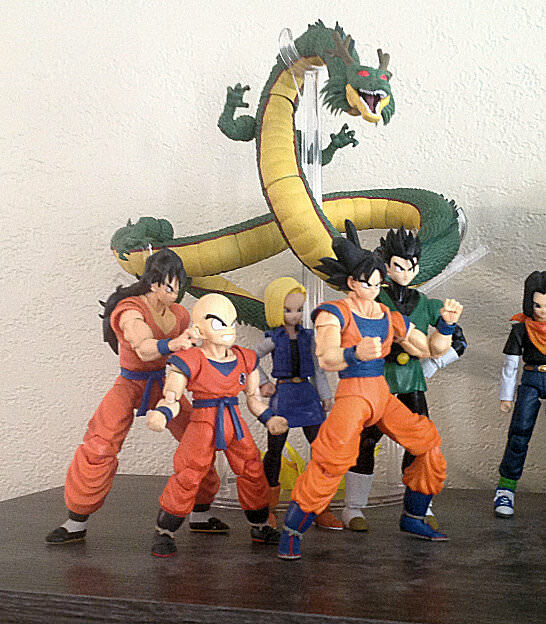 Only reason Kid Goku is even a possibility is because of the previewed Figuarts figure). I also need to go back and color code some things, such as which characters I feel need to be figures and which ones can be in-scale statues or other figures. Also, the whole reason I'm posting the list is to discuss it, so go nuts. I see the one Gohan you want is Saiyaman. You think they'll release one? Glad Chiaotzu made the possibilities. 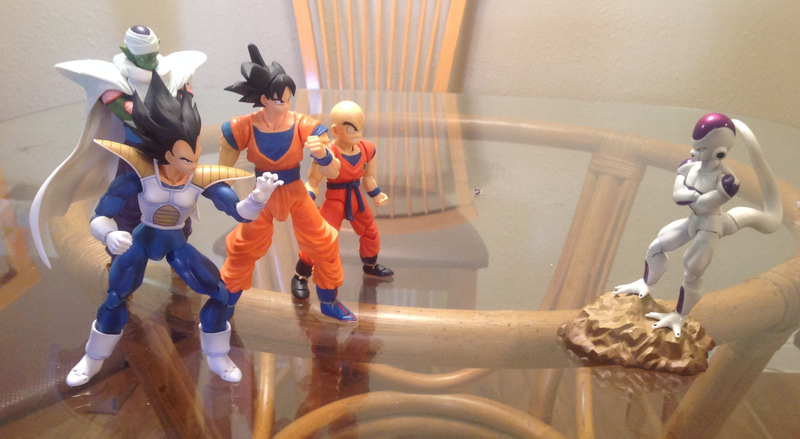 Gohan was a tough one for me to decide on. I knew I wanted an adult version of him, but I didn't care for the notion of having yet another orange Gi, nor did I like the Blue training one all that much. The Saiyaman Gi is something unique to Gohan, and I actually like him in the green: It evokes Gohan's time training with Piccolo without having to be a clone of the purple Gi like in the Cell saga. There's also shades to the battle armor he wore in the Freeza saga. 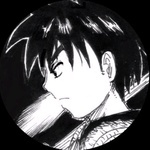 And the very idea of Saiyaman is uniquely Gohan: an identity with which he can do the right thing, but at the end of the day allowing him to have a normal life. As for Figuarts making it... yeah, I doubt it, at least not for awhile. I do think we'll get the blue gi at some point (with Ace being out there they have all the pieces) but to do Saiyaman Gohan they'd need a new skirt and possibly new legs, plus a myriad of newly sculpted heads to cover all the different variations (Helmeted, bandana/sunglasses from the tournament, and unmasked). But then, that's what customs are for, right? As for Chiaotzu, I might move him from possibilities to ones I for sure want. I don't think I'd feel right with getting a Tien and not having Chaotzu. In the end, I'm trying to get myself to a round number of characters, which means either adding a few more, or taking a few out. I'm in no rush to do that though, since Super is still a thing and there's always a chance more characters from that show will win me over in the intervening years. So I mentioned the idea of a 3 way split for my shelf over in the archenemies thread... and honestly, the more I think about it, the more it has been appealing to me as something I should actually use. I created a rough draft and I think I'll be playing with adding stuff throughout this afternoon. Also, please be aware that the titles are more to help me keep them straight then any statement on my part about the characters themselves. For example, 18 is in the "good" column instead of 16 purely to keep her with Krillin, and 17 is only in the "evil" column because I liked the synergy of splitting the trio into each section. 90% of this is whim. That said, if anyone has any ideas for it, I'd love to hear them. 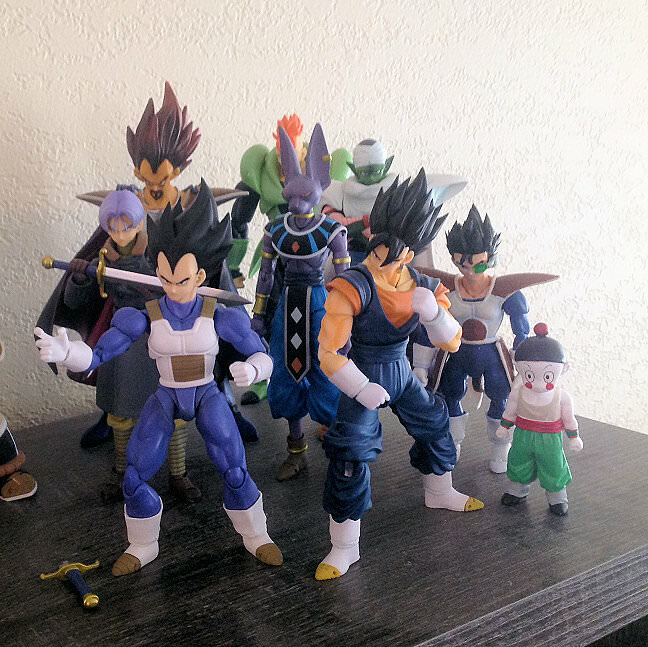 Updated my DBZ shelf with the haul I got today. Went ahead and moved stuff around loosely based on the chart I posted about earlier. Cool collection you got there Majin Tomato. 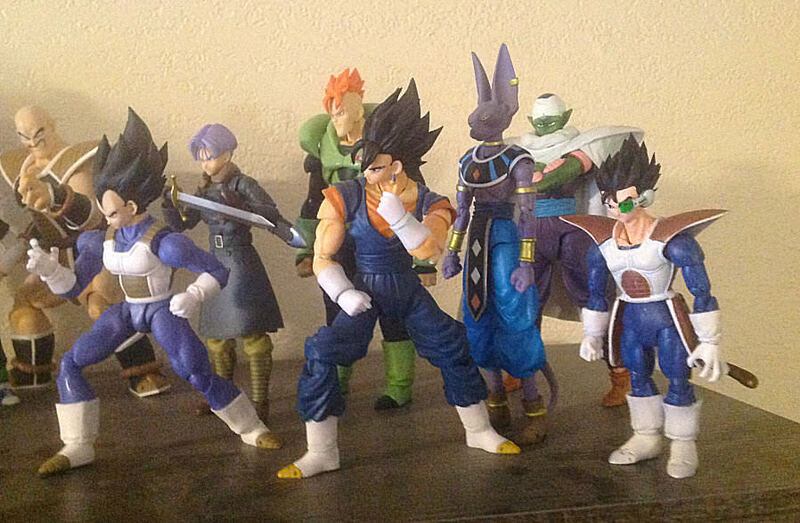 Who's the headless guy behind Goku with Vegetas boots? That will be a Saibaman Gi Gohan custom, once I get the Xenoverse Ace figure I'm going to steal his head and give his body to Trunks. Finally got around to taking this after receiving Vegeta and Vegito like two weeks ago. I'm waiting for the new Vegeta to come out so I can take his head, thinking about adapting my old Vegeta into a Tarble custom, not sure. 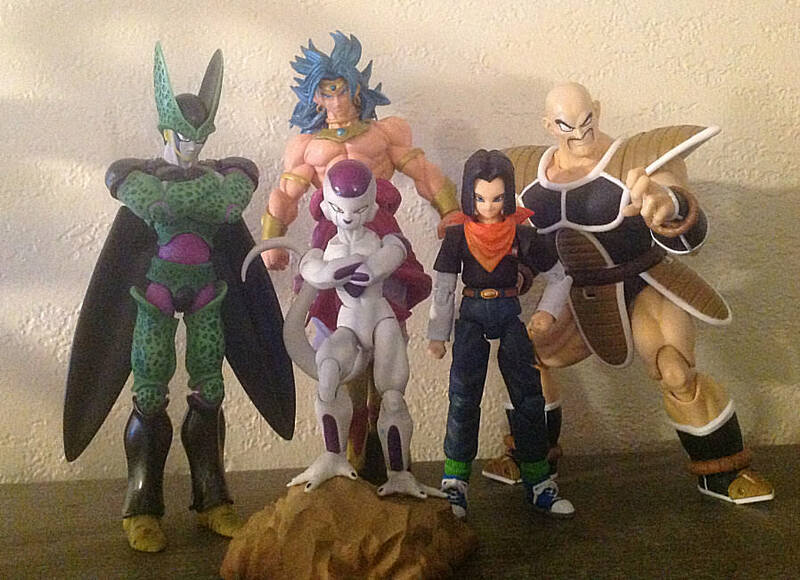 Cell is the Figure Rise Standard Version, who I have filling in until my Figuarts one finally arrives and I can finally customize him into a Final Form King Cold. 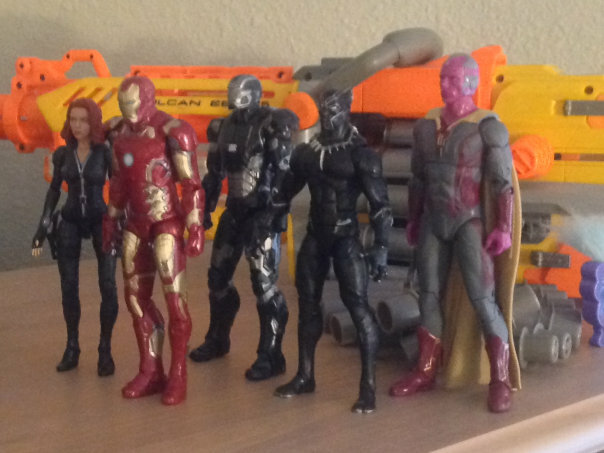 Updated this collection after stumbling across Winter Soldier (And Falcon, after having paid $31 online for him, grrrr) at my local Wal Mart. So I've been around a little bit less lately, partly due to me having the attention span of a gnat, but also because I've recently moved from an ok apartment with not a ton of space, to renting a house with 3 of my best friends. And unlike the apartment, which didn't REALLY have a ton of space for me to put my displays, we've got a bit more legroom as far as "hey, here's the top of a bookshelf I can put these figures on." Since today is my first "day off" (not really, but it was a half day) where I wasn't moving furniture up stairs and all that, I've had a bit of time to set some stuff up today, and took some photos. Before I go into that though, question for other collectors out there: A few of the friends who will be moving down have pets, a dog and a cat. I'm not really worried about the cat knocking them off directly (the more valuable displays with customs are mostly in my room, anything downstairs can and has taken a few tumbles). That being said, there are always going to be issues with figures falling due to a bookshelf being knocked, and I'm trying to think of ways to, for lack of a better explanation, glue their feet to the shelf without actually gluing them down. So this one's been through some iterations. I did finally unpack Tempest (he was made by loosecollector over a year ago, but I never unpacked him because when I got him I was moving from Maryland to Nevada, and then had no real space for displays). As for the Teeny Titans (they have a real name, but I'm not looking it up atm) I went through a few iterations of them and I'm still not entirely happy with the results. 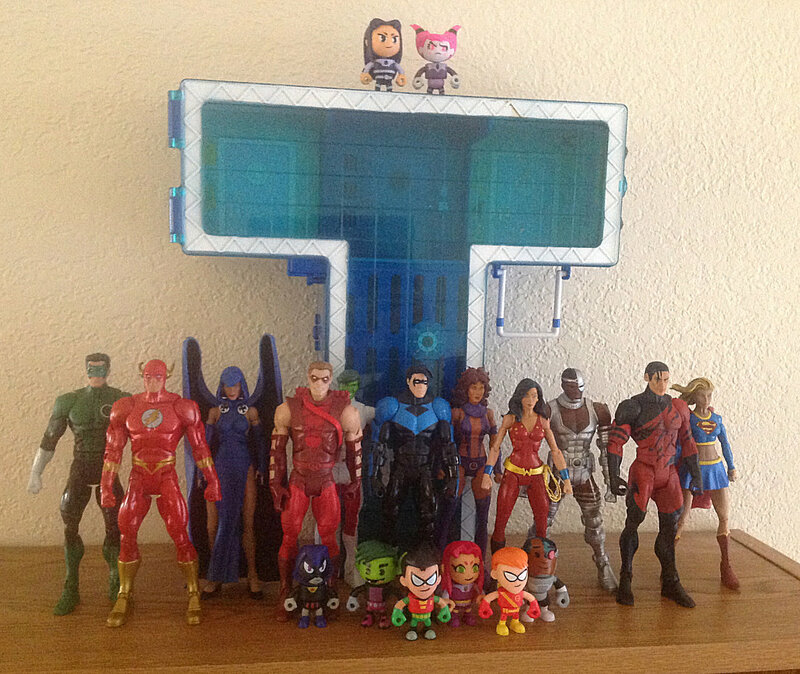 I got some of the Bandai figures from the original Teen Titans show, but those were kinda blah, they never really looked like the show, and making customs to fill in the gaps wasn't really appealing. Briefly got a few of the Jazwarez figures (which is where the Tower comes from btw) but... while I will credit them being show accurate, those were some cheaply put together toys. I bought a few larger ones for my brother (who LOVED Go) and Raven pretty much exploded right out of the box. Plus, the writing was pretty much on the wall that Mattel was taking that line away from pretty early on. The reason I'm relatively ok with this line (which is Mattel's) is that, A. I got really into the Teeny Titans mobile game (it's good. worth the 4 bucks or whatever) and B. They're basically glorified lego men. If this line dies, customs are stupidly simple. 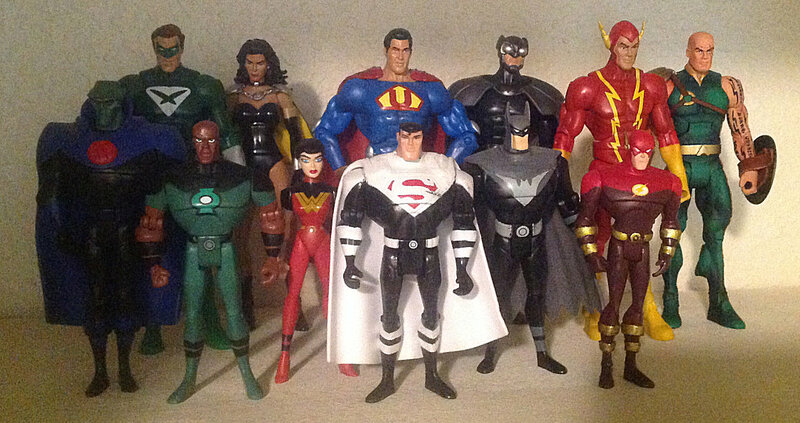 So this collection used to be a bit larger, but due to some issues (A few of the N52 league figures broke during one of the moves, and the DCEU ones... just... meh) but in a way it's also been distilled down into my favorite iterations of the two groups. Also, I've got this one set up on the shelf in my closet, which has a sliding door where you can only see one half of the closet or the other at a time: Nightmare for photos, but it's also like... I open one side, Justice League. 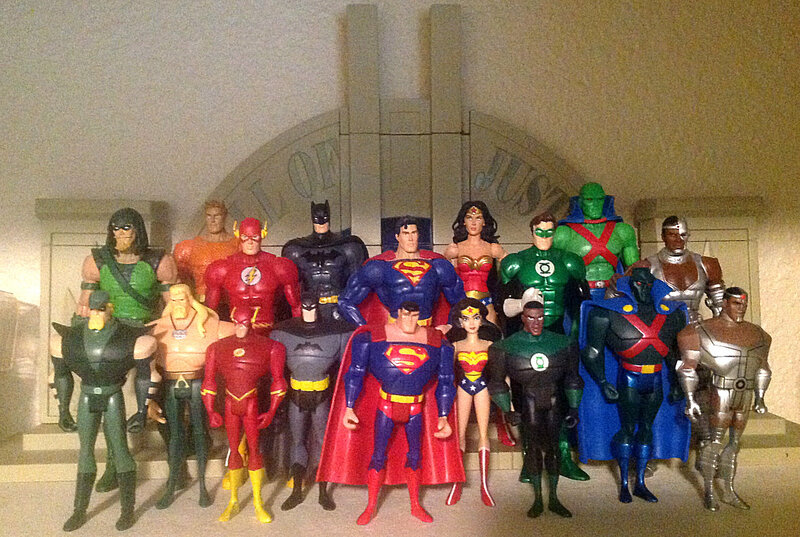 Other side: CSA/Justice Lords. So between getting the androids and the re-release of Cell I've mostly filled in the gaps with what's actually been released that I want. 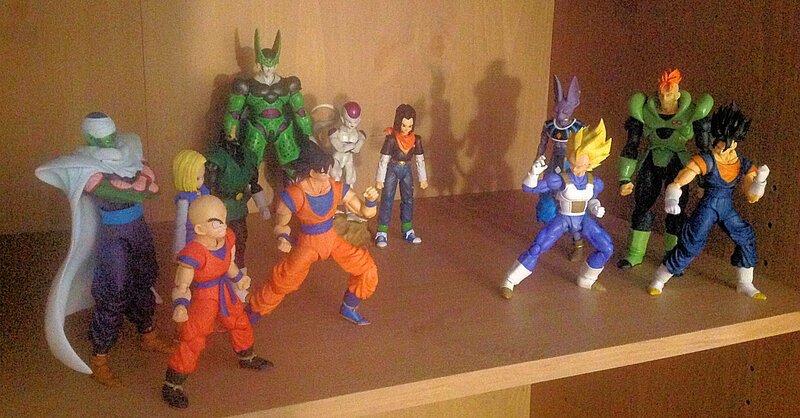 I have my WIP custom Gohan still packed up, haven't bothered to get him out since he still has no head to speak of atm. I'm eventually planning on making the second Cell (the Figure Rise one) into a custom Final Form King Cold, but I'm not there yet. Apologies on the cruddy quality of the photo, but getting a good shot with my ipad was kinda awkward. This one's had a few changes, partly due to the space I'm using for it, but also because of current and upcoming characters and figures. 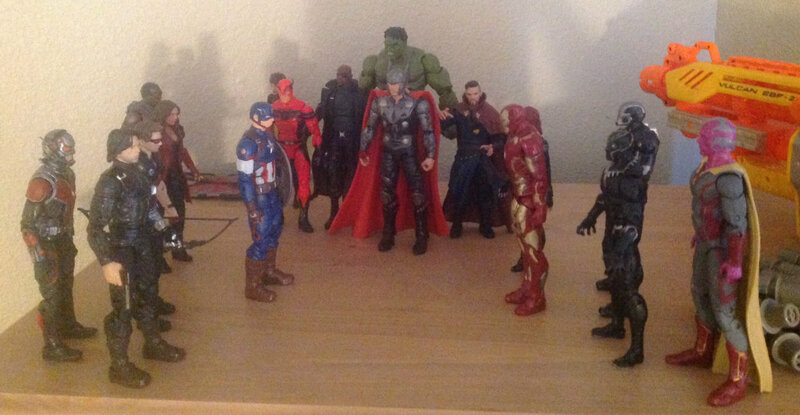 First, I removed Giant Man and Wasp. I love them, I wish OC Janet and Hank were included, but the comic costumes just don't quite fit alongside the MCU counterparts. I'm kinda waiting to see what happens with Antman and Wasp though, since Wasp will be in that film, and I've been toying with how to include Hank. Second, I picked up some GotG figures finally... 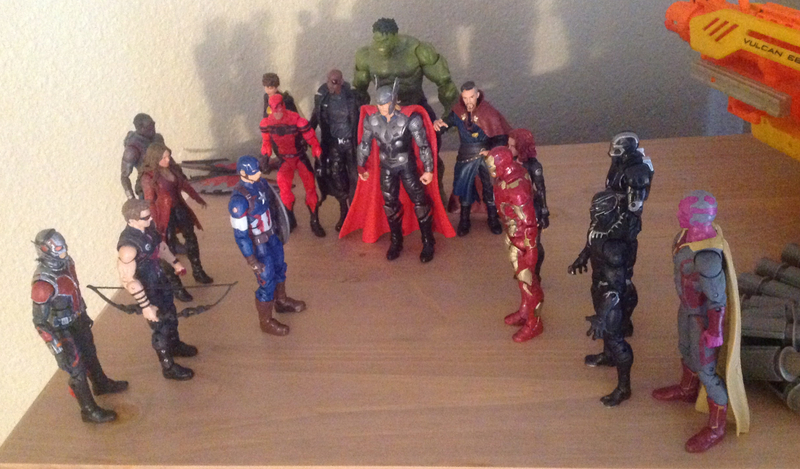 I know I know, but unlike the other MCU films, I don't have any attachment to the characters outside of the film. 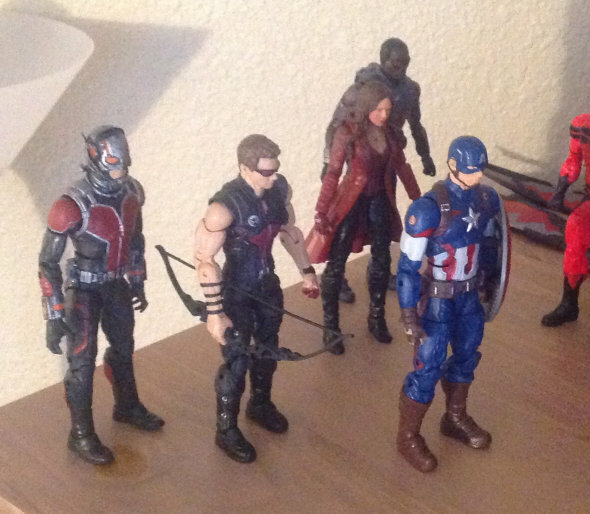 Third, I left a space open for the Netflix figures coming... whenever they're coming. I also currently have my Andrew Garfield Spider-Man chilling in the back of Team Iron Man until I bother to pick up the new SM figure. First, MCU finally has the Netflix series represented. Watched Defenders the other day, now I'm itching for a Luke Cage figure... Iron Fist can be included when he gets a decent outfit. I still need to get ahold of a MCU Spider-Man, but I likely will not be getting the Netflix Punisher. And the one most of you actually wanna see, the DBZ collection now has it's Broly. So last week I went out and got a display shelf specifically for my Spider-Man figures... figured I'd show updates to that one off here. Larger pics of the individual cubbies are up here, but I also want to show off the newly completed addition to the shelf, which has been a labor of love for me for awhile now. I'm a bit more of a fan of Harry Osborn as the Green Goblin than I am of Norman in the role. While Harry had died by the time I was 4 years old, I grew up on my dad's back issues, and I loved the complicated history between Harry, Liz, Mark, Peter, and MJ. Harry's confrontations with Peter just seemed much more... personal than they ever were with Norman, especially since... well, let's face it, aside from the secret identity thing, Norman really had nothing to do with Peter's life outside of his dealings with Harry. Harry ALSO knew Peter's secret identity, but there was also personal torment because he was also Peter's friend. And they've TRIED to do some weird father-son dynamic with Norman and Peter since his resurrection... but to me, it just wasn't as strong as what we'd gotten with Harry. 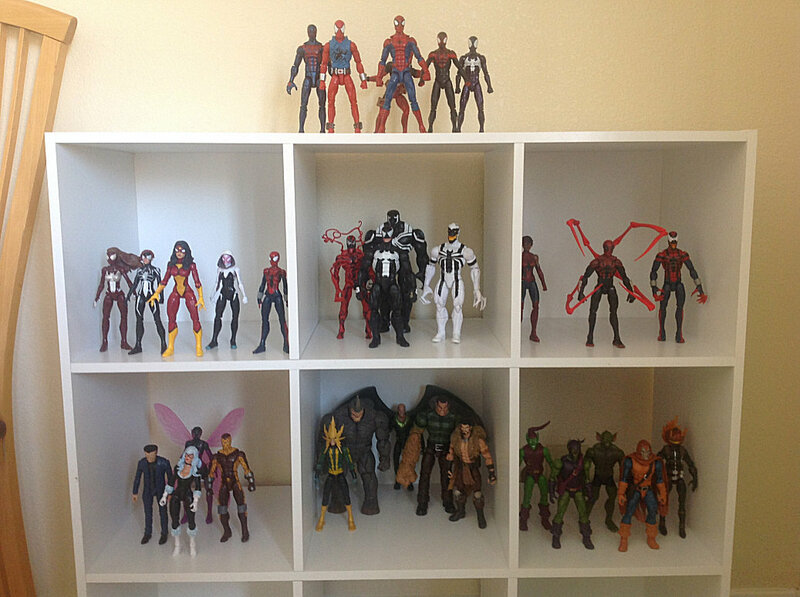 So if I was gonna do a large scale Spider-Man shelf, having a Harry Osborn was a must. But rather than do the cliche "Here's a second Green Goblin figure, and I shall name it Harry" thing, I wanted to have a Harry that was visually distinct from his father. To accomplish that goal, I took the head from the original ML Green Goblin, and trimmed the ears down so they'd be more in line with the smaller ears used on Harry's mask. I then used a Scarlet Spider body to give him the same lean body type as Peter to distinguish him from the future Green Goblin figure that was inevitable as soon as Hobgoblin came out. The result is a Goblin figure that is distinctly Harry Osborn. just dragon ball it's possible ? So just to ask, since the last post really did annoy me... does anyone else actually mind that I occasionally post my other collections in this thread? I get that this whole board is primarily focused on Dragonball, but I know plenty of members don't just collect Dragonball stuff. 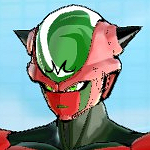 That Green Goblin I posted above in particularly was a labor of love that I've had floating around in my mind for YEARS, much like my Gohan, and I'd like to be able to share that with people. 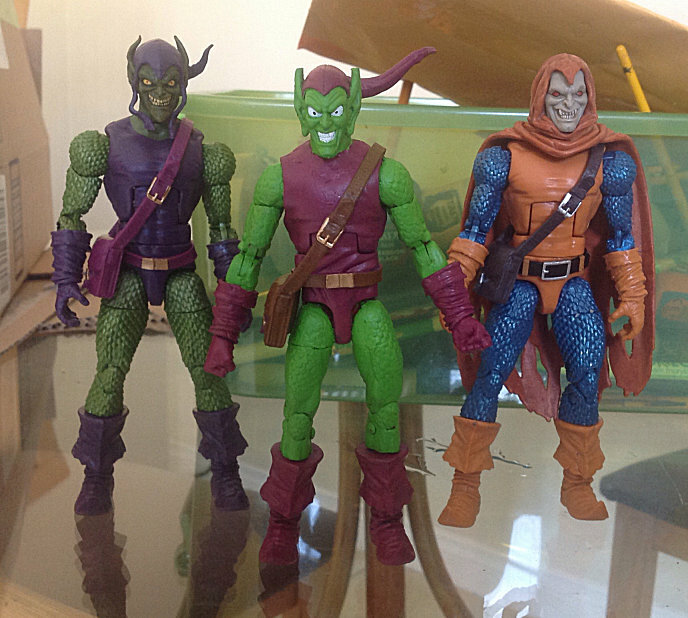 Green Goblin looks great, as well as your collection looks great. and if it helps I don't mind seeing other peoples expanded collection. Moved some stuff around and took some photos.